The summer holidays have finally hit and while we cannot always guarantee blue skies and sunshine in the North East – there’s plenty to keep the whole family busy while school’s out. To help celebrate the six-week break, we’ve teamed up with some great local attractions and businesses to help make your pennies go that little bit further, and, we’ve discounted the cost of our Go North East Family Day Ticket. Available to buy on the bus (don’t forget, we’ve gone contactless!) or in advance on our app, the family ticket is just £10 per day. 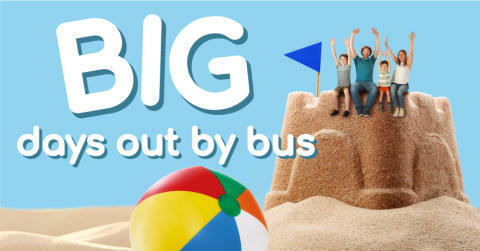 It offers unlimited travel across our bus network and covers up to two adults and three under-16s travelling together. Our big days out promotion will run until September 4th. To get involved, all you need to do is show your family day ticket to any of our participating partners, to get a discount. A full list can be found here. For those rainy days, the Life Science Centre, Newcastle doesn’t disappoint. An interactive day out for the whole family, learning about science has never been more interactive or fun! Currently running is the Dino Jaws exhibition, straight from the Natural History Museum. Children enjoy free admission with every full paying adult. When the sun does finally show its head, what could be better than a day at Beamish Museum, County Durham. Save 25% on the standard admission price, with your Go North East Family Day ticket and take a walk around the world-famous open-air museum. With blockbuster releases everyone will love, including Despicable Me 3 and Cars 3, now on the big screen,10% off cinema tickets at the Gala Theatre, Durham will be a welcome treat. Simply quote 'GNECINE10' in person at the box office and show your Family Day Ticket. Looking for something a bit more energetic, then our partnership with MFA Bowl in Sunderland is just for you! Family bowling, including up to four people, is just £10 when you show your Family Day Ticket. Wherever the summer takes you in our beautiful region, we can get you there on our range of frequent services. Use our handy Journey Planner to find out how!